Sometimes designing for technology isn't about more buttons and features. Sometimes it's not about touchscreens, wireless access or voice-activated whatever. Sometimes it's just about convenience ... make my life a little easier, let me enjoy the view, give me a place to put my new TV, help me get a little more organized. 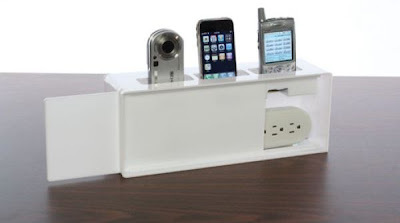 Place a power outlet on the wall in the kitchen or near the front door, hang this charging station over the outlet, connect a power strip and ShamWow!, you have yourself an apartment that's ready for all of your residents' mobile devices. Life is instantly a little less cluttered and a bit more organized. The stations come three different colors -- pick them up for $40 a piece here.